We LOVE Asian food. So, naturally that’s where our heads went when we started planning our meals for our first week. The first dinner for our Whole30 journey was inspired by a 40Aprons recipe. Adapting familiar foods to fit our everyday life at the same time being Whole30 compliant is important to many. 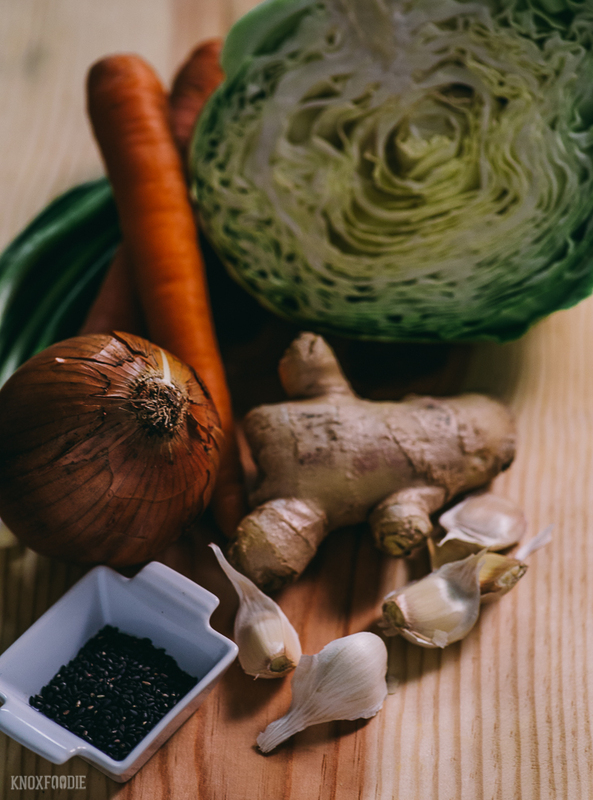 For instance if one family member is doing Whole30, the rest of the family doesn’t want to feel like they’re being forced into something like a ‘diet’ and reverse that, the Whole30-er shouldn’t feel like they are having to sacrifice flavor for the program. This dish ticks all the boxes. 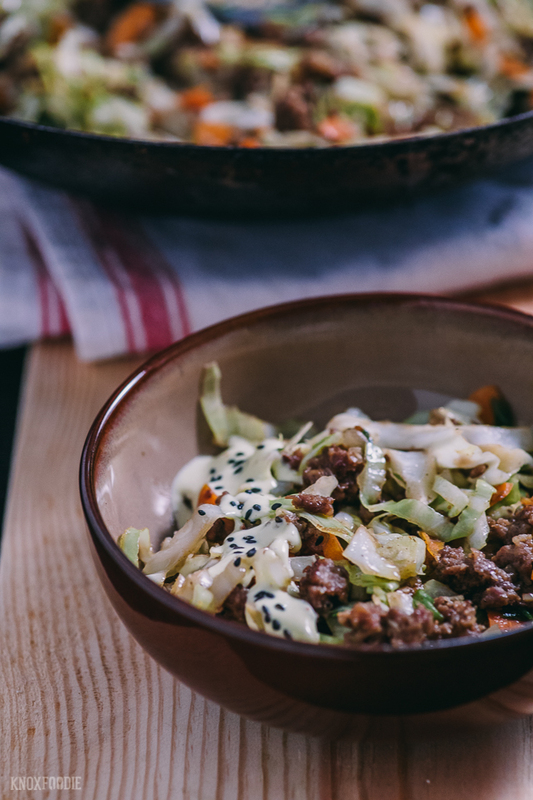 The pork along with the creamy sauce satiate the need for fat and it’s packed full of flavorful vegetables and low on carbs because it’s a bowl instead of an actual egg roll. 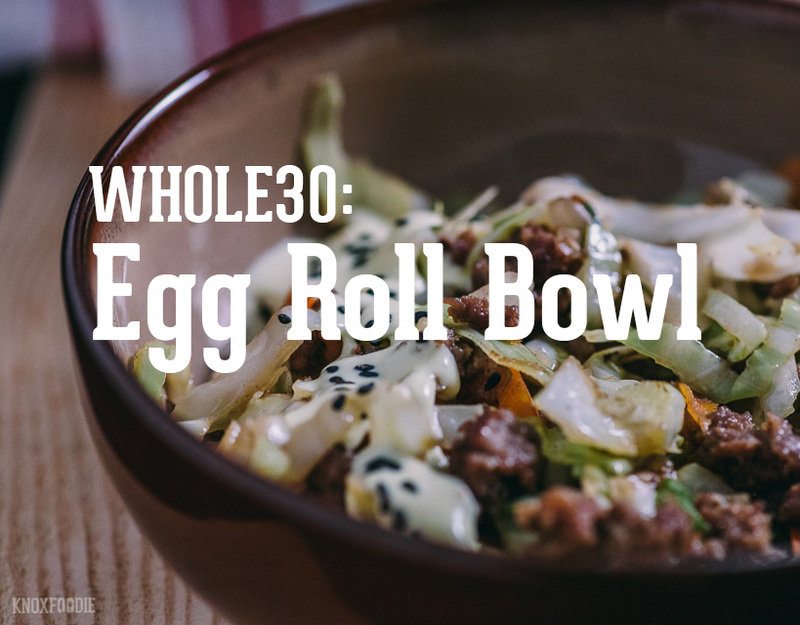 For those not on Whole30, these work great in a traditional egg roll wrapper. This recipe is also paleo friendly. We used a head of cabbage and a couple of carrots instead of the cole slaw mentioned in our inspiration recipe because we are using the other half of that cabbage for another meal. We also lean on Olde Virden’s Red Hot Sprinkles instead of most hot sauces not only because they are friends of ours but they make a quality product using only dehydrated chili peppers. We’ve found in short order that Coconut Amino is going to be a crutch we go to a lot to deepen the flavor of our dishes. For those of you that hate coconut, don’t worry. 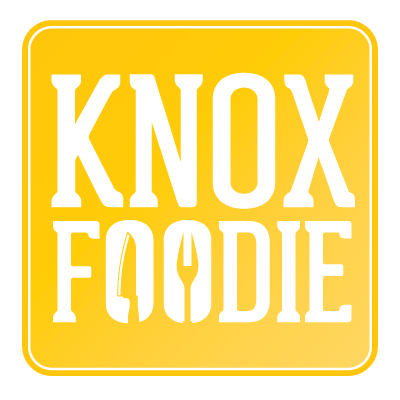 Mr. KnoxFoodie always says the only food he truly hates in all forms is coconut. No coconut cake or pies, no organic coconut oil, no coconut shrimp…nothing! Hate is actually a mild way to describe how he feels about coconut. OK, enough on that, he loves coconut amino. There’s an almost undetectable hint of coconut flavor in this. It’s your new soy sauce but maybe a little more like teriyaki. More complex than average supermarket soy in many ways. Get a bottle even if you aren’t on Whole30. It’s something we will definitely keep around. A quick, filling Whole30 recipe that can be easily adapted for the non-Whole30 family members or guests. Pour sesame oil into large wok or skillet and over medium heat. Heat until shimmering. Add white parts of green onions, yellow onion, and garlic. Sauté, stirring frequently, until yellow onion begins to soften and turn translucent, about 5 minutes. 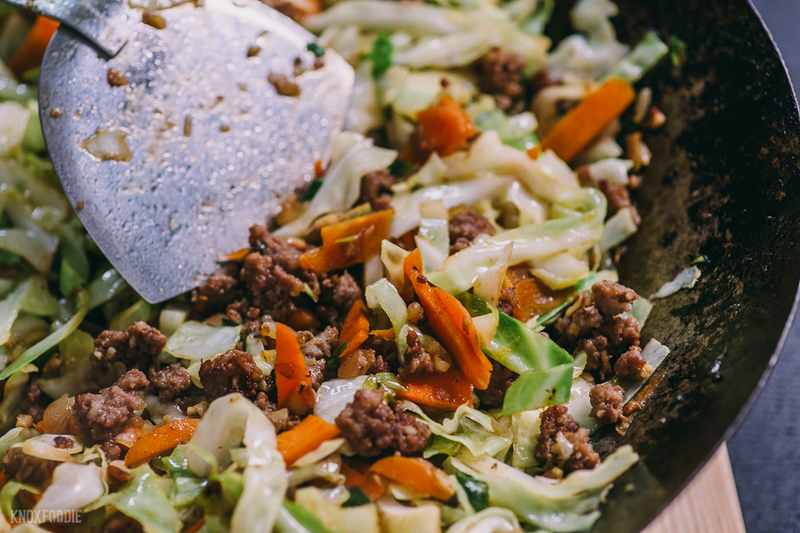 Add ground pork, fresh ginger, and Olde Virden's Hot Sprinkle. Cook until pork is browned and cooked through, about 20 minutes. Add cabbage, carrot, coconut aminos, rice wine vinegar, pepper. Season with salt to taste. Stir until well combined. Cook, stirring regularly, until cabbage is wilted, about 5 minutes. Meanwhile, in a small bowl whisk together ¼ cup mayonnaise, ½ tsp lime juice, a splash of coconut aminos and, optionally, a pinch of Olde Virden's Hot Sprinkle. Add a pinch of salt, to taste. 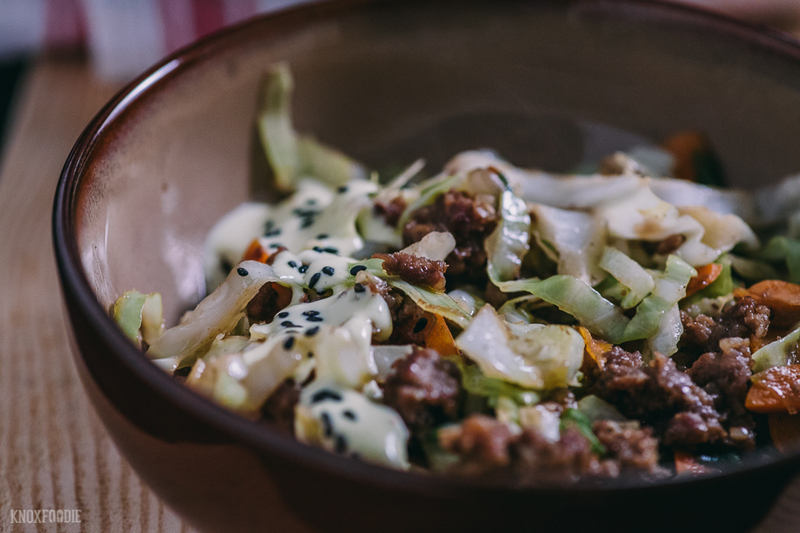 Plating: Add ¼ of pork/cabbage mixture to bowl and top with 1-2 tablespoons of creamy chili sauce. Garnish with green parts of the green onions and black sesame seeds. We like this mayonnaise recipe. Leftovers: Try topping leftovers with an egg for breakfast. 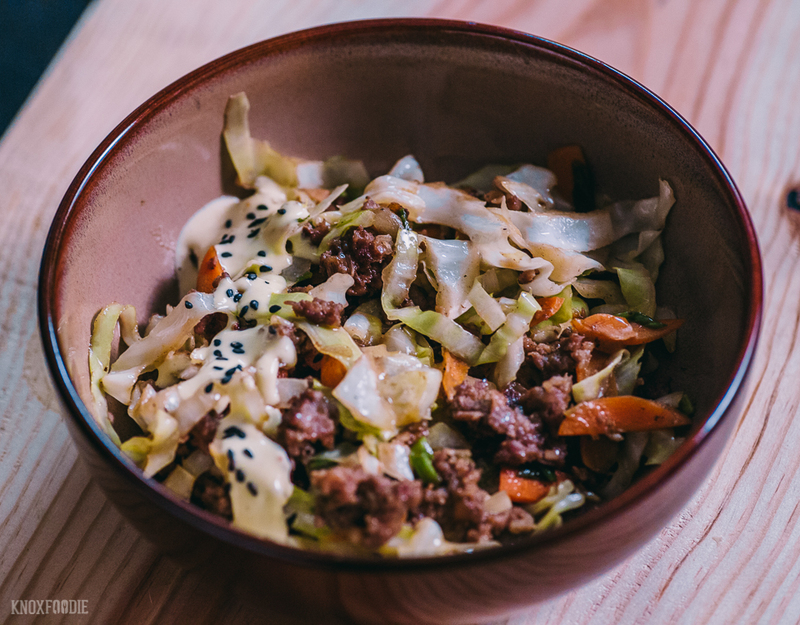 For lunch, wrap 2 tablespoons of pork with a large blanched cabbage leaf. Steam in vegetable steamer for 10 minutes. Serve over zoodles or cauliflower 'rice' with spicy mayo.